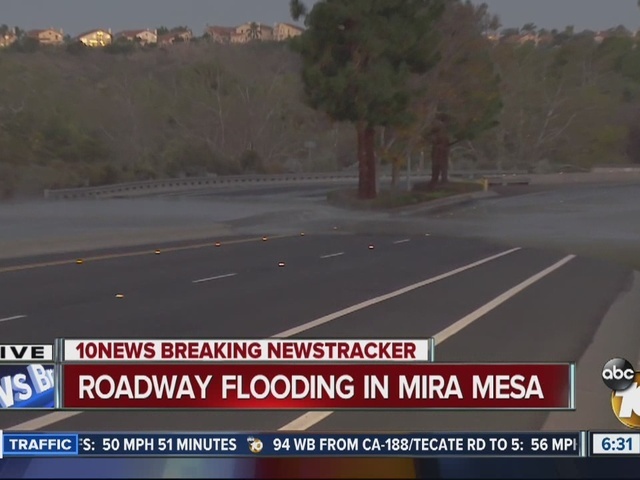 A water main break flooded an intersection in the Mira Mesa area Wednesday morning, left nearby homes and businesses without running water, and prompted authorities to shut down a stretch of a busy roadway. A 12-inch concrete pipe ruptured near the intersection of Black Mountain and Mercy roads shortly after 6 a.m., according to the city Public Utilities Department and San Diego police. The break sent water gushing into the northbound and southbound lanes. The water was about a foot deep in the roadway. Utility customers in the 11900 block of Black Mountain Road were without water service initially, but the break was later isolated, and service was restored, Public Utilities Department spokesman Arian Collins said. A Sig Alert was issued about 20 minutes after the break was reported, San Diego police Officer Frank Cali said. Southbound Black Mountain Road was closed to all traffic, including pedestrians and bicyclists, at Park Village Road. Northbound Black Mountain Road was closed at Mercy Road, according to the officer. Officials initially said repairs would likely be complete by 8 p.m., but repairs were finished by 4 p.m.